Even though present-day Afghanistan flies under the news radar, it remains to be the longest military quagmire in US history. Aside from troops still occupying the country, thousands of private contractors are on the ground that the Pentagon can’t even account for. Considering how Obama’s foreign policy strategy has been to replace ground troops with drone strikes, the administration’s logic behind continuing the occupation remains unclear. War has always been about resources and control. Alongside the supposed surprise discovery of Afghanistan’s $1 trillion wealth of untapped minerals, the Taliban had successfully eradicated the opium crop in the Golden Crescent before the US invasion. 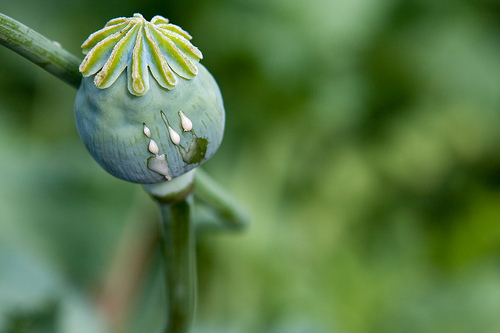 Now, more than 90% of the world’s heroin comes from the war torn country. Wow, that’s a lot of opium – and a lot of money being made. So, who is reaping the spoils? Many people outright dismiss the notion of the CIA overseeing the trade of illegal drugs as crazy talk. However, history shows that it’s crazy not to entertain such a notion, especially during times of war profiteering. These are far from isolated incidents. During the eighties, the CIA financially and logistically backed anti-communist contras in Nicaragua who also happened to be international drug traffickers. Circumstantial evidence aside, there is no conclusive proof that the CIA is physically running opium out of Afghanistan. However, it’s hard to believe that a region under full US military occupation – with guard posts and surveillance drones monitoring the mountains of Tora Bora – aren’t able to track supply routes of opium exported from the country’s various poppy farms (you know, the ones the US military are guarding). In today’s globalized world of rule-for-profit, one can’t discount the role that multinational corporations play in US foreign policy decisions either. Not only have oil companies and private military contractors made a killing off the occupation, big pharmaceutical companies, which collectively lobby over 250 million dollars annually to Congress, need opium latex to manufacture drugs for this pill happy nation. As far as the political elite funneling the tainted funds, the recent HSBC bank scandal exposed how trillions of dollars in black market sales are brazenly being laundered offshore. Multinational corporations are in it for the long haul, despite how low public support is for the war. A little mentioned strategic pact has already been signed that will allow a US troop presence to remain in Afghanistan until 2024. The unwinnable nature of the war becomes more apparent when learning that the US government was paying Taliban insurgents to protect supply routes and “switch sides” in an attempt to neutralize the insurgency. The logic of funding both sides of the war to “win” is too incomprehensible a concept to grasp. Clearly, this war is meant to be sustained. Baseless rhetoric aside, here’s the hard, hypocritical truth: this government is fighting a multi-billion dollar ‘War on Drugs’ worldwide, resulting in thousands of deaths every year and millions of nonviolent drug users rotting away in prison. Yet, the US is at the very least protecting the largest source of the deadliest and most addictive drug on the planet. If not for the obvious, then why? Angus, this is at least some evidence. I know you are not reading this anyway because you are a small minded idiot!